Sometimes you just gotta get away to let your brain take its own vacation day and enjoy some planned nothingness. One of my favorite escape destinations is the Franciscan Retreat Center at Mount St. Francis along the northwestern foothills of Colorado Springs. For the past fifteen years or so, I have enjoyed an annual personal spiritual retreat day to the sprawling campus—home to a number of retired Franciscan nuns, a nursing center, parish church, and scores of deer and other wildlife. I spend most of the day holed up in a quaint cottage-style room with my Bible, journal, and a few inspirational books. I sip hot tea, read, contemplate, nap, gaze out the window, pray, and walk the grounds. 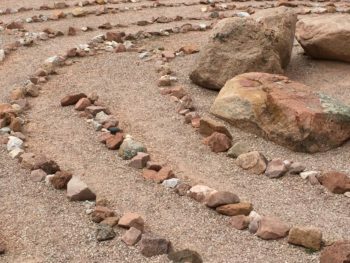 Sometimes I meander to the stone and gravel labyrinth (can you say spellcheck?!). Labyrinths are geometric forms that honor a sacred space and date back at least 4,000 years to nearly all religious traditions. Many early churches incorporated labyrinths as floor mosaics within church structures. The one at Mount St. Francis is simply assorted Rocky Mountain stones on a bed of gravel. Simple yet profound. 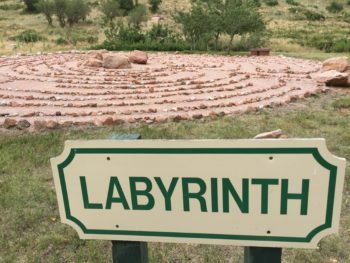 There are encouraged stages of walking the labyrinth in which you release your thoughts and emotions and connect with God when you reach the center. I am intrigued by the looping around and coming to forced turns that at times take you all the way back toward the path’s beginning. Where is this heading? Man, I have to go THAT way? Will I ever get out of this endless circle? The center looks so close yet so far away! My mind always zips with these kind of quandaries until I start to calm my heart and my pace. Labyrinths are perfect for people like me who can over-think and look for the fastest, most convenient way out of a jam. Ahhhhhhh … slow. Breathe. Keep turning. Stop. Look around. Look how far you’ve come! Sit. Think about nothing. (Now repeat on your way out.) Look how far you’ve come! Look around. Stop. Keep turning. Breath. Slow … Ahhhhhhh. With a labyrinth, the way in is the same way out. You don’t really see this when you first start on the path, and with all the unexpected dead ends and twisting circles, you can get a bit dizzied. But not if you just keep focused on your next step. Just one … with no over-thinking tumbling ahead. Life is like a labyrinth inviting us to pace ourselves and let our brains take a mini-vacation now and then. These brain-breaks are good for the soul too. Just God and you and shifting into neutral. And, if you’re like me, you allow yourself a cell phone photo or two to capture the planned nothingness. What a wonderful way to escape the parts of life we want to forget for “just a few minutes”. I am so blessed to have you as a friend! Thank you, Kris! I’m glad you could take a reflective pause with me. I am beyond blessed to have you as a friend too. This is a lovely thought to mull over as we meander through the uncertain changes of a new season ahead. I love the word “meander” because it’s often how life unfolds. Here’s to great expectancy, Reasie, in your new season ahead.